Our Top 3 Picks for the Best Ground Blind - Surprise Your Prey! Hunting ground blinds give hunters the advantage when trying to take the element of surprise to a new level out on their hunt. Blinds are often enjoyed by older hunters, but this doesn’t need to be the case. You can find ground blinds for every age and hunter. Unlike a layout blind, you’ll find that with many models, they are large enough in size to allow you to fit more than one person in the blind at a time. Some of my favorite memories are hunting with my grandfather and spending quality time together with him in our hunting blind waiting for our prey. Why choose a hunting blind? Game that is in the vicinity of the blind won’t even notice it – if it’s a good one. We’re talking deer being less than 5 feet from the blind practically, setting a shot up for us. Blinds are also perfect for hiding your gear, like blind bags and decoy bags or your lunch. We’ve chosen a few of the top ground blinds on the market, and we’ve reviewed them for you. What’s special about the Care Taker is that this model weighs just 16.8 pounds, and this is light considering how big this blinder is when opened. Setup is very easy, too. 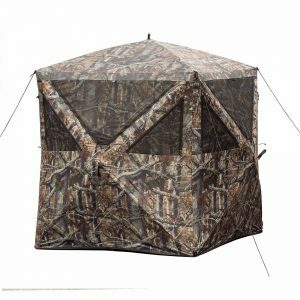 You can set up and take down this hunting blind in the same amount of time it takes to set up a tent. If you like to hunt with a partner, most people do, you can comfortably fit two people in the blinder at a time, and you’ll have more than enough room to place two chairs in the binder, too. And when you go to take a shot, you’ll find that there are three sides available where you can shoot through. The only place where visibility is limited is the side of the blinder that has the door. You can shoot out of any of the other sides of the blinder. Windows open and close to be able to shoot out of them. Keep the windows open on all three sides, and you’ll be able to shoot quickly and efficiently. Users that are 6’ tall will need to bend over slightly when standing, so users that are even taller may have an issue standing fully erect in this blinder. => Click here to learn more about the Ameristep’s Care Taker. The Evolved Ingenuity is a hunting doghouse blinder that is so affordable it’s almost an impossible choice not to consider. This model also blends right into nature, and its sleek design still offers enough space for multiple users. Made with 100% polyester, this blinder is just as durable as it is aesthetically pleasing. Ameristep has included the company’s signature Realtree Xtra Camo pattern with this model, too. 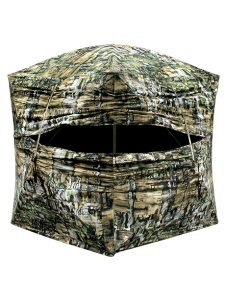 What this pattern offers is the perfect cover for anyone who is hunting in wooded areas. The blinder will meld right into the scenery – and animals won’t even see you coming. Shoot-through mesh allows for quick target changes, and this model is designed to be able to quickly shoot arrows or firearms. Portable and compact, the weight of this model is just 12.8 pounds, so it’s extremely easy to transport. A carry bag is included, and it has back pack straps that allow you to strap it securely to your back. There is a zippered pocket for added storage, and it’s water-resistant, which will help you stay dry and warm during your next hunting outing. Quick and easy to put up and take down, it’s recommended that you keep the windows unzipped so that you can react quickly if any potential kills walk by. Otherwise, you’ll need to fiddle with the zippered window, which can waste time and lead to your kill walking calmly away. => Click here to learn more about the Evolved Ingenuity 1RX2S010. The Primos Double Bull is a deluxe blind that has a hub-to-hub width of 77”. In terms of floor space, users are provided with a gracious 60” x 60” floor space, and they also receive 180-degree full frontal views that allow for the utmost in visibility at all times. What’s unique about this high-end blind is that there is a zipperless door entry, which allows for silent entry into the blind at all times. you’ll be able to enter the door with complete silence even when you have a full set of gear on. And this allows you to have the advantage when waiting for prey. The less noise that a blind – or you – makes, the better. Animals will skitter away at the faintest sound to avoid predators, so this small feature can mean the difference between going home with dinner or an empty stomach. There is a 180-degree viewpoint when you’re setting up a shot, so you’ll need to aim the blind in the proper position while waiting for a kill. A floor isn’t included with this blind, but there are flaps that work to keep insects out of the inside of the blind. While many view the lack of a floor as a concern or con, it also lets this blind remain extremely light and easy to transport. The window hook system also adds to the “stealth” of this blind. 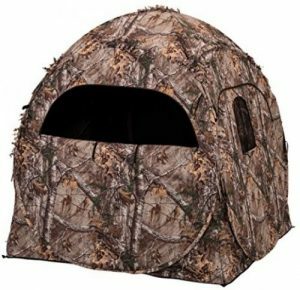 It’s a great overall blind, and you can bring a friend, nephew or anyone else with you on your next hunt, too. => Click here to view more information about the Primos Double. When you search for a ground blind, you want to make sure that it’s large enough to bring a friend along with. And you also want to be as “one with nature” as you possibly can, which is what the quiet design and camo features are all about. Which is the Best Layout Blind for Duck Hunting in 2016?